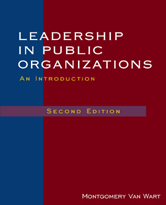 This concise, yet comprehensive treatment of public sector leadership is designed for upper level and graduate students, and can also serve as a guidebook for professionals in the field. In addition to a full, up-to-date review of leadership theories, it covers the main competency clusters in detail, and provides both the research on each competency and practical guidelines for improvement. These competencies are graphically portrayed in a Leadership Action cycle that aids students in visually connecting theory and practice.